Poll: What should a tamed Frore do? A frozen steampunk dimension...in space! I'm on board with colored crystals and colored light, though for that we'd need yet another lighting engine rewrite. Colored lighting is technically currently possible, but it's kind of hacky and doesn't work with smooth lighting (or shaders, I'd imagine). I feel like we've hit an interesting idea here- a frozen, crystalline dimension, maybe even with prehistoric animals and ruins. EDIT: Just noticed those weren't in second place. - What mobs will reside in this dimension? - What blocks/ores will be in this dimension? AKA What resources will be obtained from this dimension? - How will this dimension benefit the player? How will it benefit players with different play styles? - How do you access this dimension? 2.- What mobs will reside in this dimension? 3.- What blocks/ores will be in this dimension? AKA What resources will be obtained from this dimension? 4.- How will this dimension benefit the player? How will it benefit players with different play styles? 5.- How do you access this dimension? Well, I was joking, but I think taking elements could be taken from all the suggested ideas. Though since Steampunk is obviously the best idea a frozen Steampunk city would be amazing. Also, the End is not a confirmed abyss or the moon, and it is definitely not underwater, so I don't know where that idea came from. 1. It should probably be atmospheric, with the classic Minecraft mix of piano and (what I think is) 8-bit style instruments, with some frosty bell-like motifs. 3. Fishg mentioned crystals, which I like. I don't think adding more ores is a good idea without overhauling Minecraft's damage and defense systems. Instead, perhaps these crystals, along with decoration, could be used for more kinds of buffs. 4. That's a whole discussion in it of itself. We need a rough draft of the basic suggestion first. 5. Since hyperspeed train travel apparently isn't cool enough, perhaps a portal could be made from a resource dropped from strays. I assume the frost-dimension we're going for would be the one I suggested right? I just want to say that I really enjoy the rainbow, whimsical feeling people have hinted at. I think the music should be similar to the creative music, soothing, exotic, but perhaps with wood-wind and chime instruments? And as for the mobs, I was thinking that there could possibly be some kind of large floating blueish-magenta colored beast that looks similar to a Blue Angel (a little poisonous thing that lives in water). It could kinda be Aurora-themed, and be similar to the floating whales someone suggested earlier! As for the steampunk stuff, if we go with this dimension and my ideas, we could put them on the floating islands above the Flurry Fields! I have an idea that incorporates steampunk into the frost dimension without messing the natural beauty or theme. The music should probably be something light and mystical. Perhaps these instruments, , playing a remix of classic minecraft music? Anyway, the music would be common throughout the dimension to reinforce the beauty of the natural world. But every now and then, you would find a different island filling the gap in the floating islands (are we going with floating islands?). These would be Steampunk Stations (name WIP). These giant, dark, structures would greatly contrast the bright frosty world it surrounds. The closest thing I could find to what I'm thinking. Inside the huge stations would be a labyrinth of passages, filled with evil robots and useful gadgets. To differiante it further from the rest of the dimension, these dungeons would have its own, drum heavy music, resembling this. Thoughts? I feel that this might be the best way to add the two most popular suggestions so far into the dimension while keeping a cohesive theme. EDIT: Well I guess text video links don't work. But every now and then, you would find a different island filling the gap in the floating islands (are we going with floating islands?). These would be Steampunk Stations (name WIP). These giant, dark, structures would greatly contrast the bright frosty world it surrounds. The closest thing I could find to what I'm thinking. I'd think it would be better to have a predominantly dark steampunk theme with a bit of etherealness to it. Console Battle is two games rolled into one: gambling (whether or not you get one of the OP weapons) and betting (which teammate won't turn on you, since teaming is pretty much a requirement to kill off another team)! Of course, it's not all chance; at its core, Battle is about triumphing and defeating other players... by kicking them out if they win to make yourself feel better. Some (quality) not sucky suggestion threads I made: Console Minigame: Ram Attack! - New Arrows! As far as music is concerned, I wouldn't worry about it until later, if at all. Music is generally going to be among the last things to be tackled, since by then we'll have the feel and content in the dimension completed. There's that, but chances are if this were to be official we'd let C418 work his magic. As far as blocks are concerned, what about a sort of Aurora block? A lighting block that gives off colored light, and perhaps the color changes depending on its location in the world, and/or time of day. For mobs, I do like the idea of the seaslug/nudibranch type of mob, along with SPACE WHALES! What if we had a sort of stone golem protecting the dungeons, and we could create a ranged golem with their drops and blocks mined from this dimension? I'm also on board with Wolf's idea of having a few pets here. For the item needed to access this world, perhaps it would be crafted from some of the drops of guardians alongside a stray's drops? That'd make it mid-late game proper. Note, I'm not talking about elder guardians. They don't respawn. Also, how dare you. Hyperspeed trains are best trains. - Dark-ish colors, like the bottom of the sea (there is little light down there, you know). Oh, and the music suggested by fishg was really good. Exactly what I was thinking. Though the Nether has gotten brighter over time, I think it covers the dark theme. Look at older videos of the Nether, from like Minecraft Beta. It was really dark and spooky then. Also, I think it is important to have a contrast between the different dimension themes. I think a feathered dinosaur could be a really cool addition to a snowy/frosty dimension. Since there's also the steampunk theme, we could have the dungeons people have been talking about. I really like the idea (that's already been mentioned) of having rare towers that are the dungeons. They would add a really cool exploration aspect, as it would excite the player when they see it in the distance. Now, how are we going to incorporate the space theme? We don't have to (since it's only in 2nd place), but it'd be interesting to consider. There's a few ways we could do so. To start, we could have there be massive moons in the sky, alongside aurora. Kind of like some of the Spyro level backgrounds. There could also be lower gravity, although that might affect a few things in a negative manner. That one could use some deeper thought. Perhaps some of the floating islands could have a very asteroid-like look to them, with them largely being barren. That, and maybe there could be a way to exit the dimension and fall back into the overworld from above? While true, the space thing is optional, but I think it'd be a neat aesthetic to push if possible. maybe there could be a way to exit the dimension and fall back into the overworld from above? What if, in canon, this dimension was in the sky far above? Like how the void is technically not in Minecraft canon, and the single bedrock layer is the only thing separates the overworld from nether. It would easily work with the frost theme (its colder the higher up you go irl), bigger moon (you're closer to the moon), and the less gravity idea (farther from the center of the world). Falling down through the world would take you to the top of the overworld, and with an elytra you could glide down between dimensions. I don't want to give too much lore to this world, but still it's interesting to think about and would explain a lot. If we go with the "Tower Dungeons" idea, what if we made it so that gravity changed when you got closer and closer to the tower dungeons, as if they had some sort of gravitational power? I don't really like the "falling down puts you in the Overworld" thing. I think it'd be better if this was some sort of semi-moon; it could be its worn planet, but it orbits the sun so close to the earth that it is sometimes pulled in by Earth's gravity. You could maybe even slightly see it during the night or day on earth on rare ocassions, similar to how you can sometimes see Venus in real life. You've reminded me of something we need to cover, though. Both gameplay wise and lore wise, what is at the bottom of the world of this dimension? I don't think it should be bedrock. What if we had the frost dimension have a genuine bottom, as opposed to the Overworld having the Nether at the bottom of it? We could go with some kind of crust that becomes harder to harder to mine, and eventually impossible to break. Basically, I think we should not use bedrock as the bottom of the world, as it would be unclear whether there is a Nether for the dimension. That's something neat to think about. 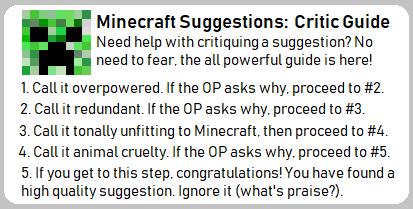 Although, as with other things in Minecraft, I think we should leave that up to the individual's interpretation. However, what you're saying pretty much goes along with my whole ozone idea. What if instead of void or bedrock, what if we had clouds and/or a thin aerogel-like liquid that the space whales can be found in when not flying? The gravity idea I like a lot. Although if we introduce it, I only think it's fair that you can craft blocks that make a gravity-like effect, to give players more to play around with in contraptions. I think we should stick to having a solid bottom. Remember: it's not really the bottom, but rather the outer crust of the core of the world. Maybe it could all be some sort of unbreakable crystal? Or maybe an obsidian-like block that takes forever to mine, with some sort of lava or something under it that causes certain death. That could be interesting as well. I'm actually not sure on this one, though. Will everyone be ready and okay to decide the dimension theme/setting on Sunday of next week? EDIT: More people have voted. Space has come in second, with Steampunk and Prehistoric in third! To the person that made that vote: who are you? Personally, (and this could just be me) I think we have a good idea here with the Steampunk and Prehistoric theme mixed in with the Frost Crystal theme. Speaking of which, what would we do to make sure that players don't cheat the tower dungeons with the elytra? They could just firework up to the top probably. I definitely think space would fit in more than prehistoric. If we go with the vibrant mystical feel with aurora and ice crystals, space would definitely be better than dinos and mammoths, although I would of course be up for some prehistoric-esque creatures. Notice the esque, because I don't think we should just put straight up dinos in the game, we should bring some level of originality into it. Maybe the gravity could prevent the elytra from working. Or, maybe the "snow" or "crystals" flying through the air would prevent the elytra from functioning. To be honest, I would really like a dimension that is so challenging not even elytra can work in it. course be up for some prehistoric-esque creatures. dinos in the game, we should bring some level of originality into it. I've already mentioned that they wouldn't retain the names of the dinosaurs; that would be a little silly. The thing is, the space theme was sort of its own thing- a whole dimension dedicated to space. It wasn't auroras in the night sky. So, if we did add auroras into the night sky of this dimension, they wouldn't really go under the "space theme." Also keep in mind that these won't be the dinosaurs you're probably thinking of- they would be covered in feathers, mostly white, and of course, living in the snow. When it comes to the space dimension, we really don't have any solid ideas besides asteroids and space whales- not much to go off of. Perhaps asteroids could be replaced by floating islands or walkable clouds, and maybe space whales can stay. But after that, I don't think the space dimension would work with frost. Also, should we start brainstorming dimension names? How about the Frist? We need a space dimension to give some final fist of ending to the mainstream game. & the dimension should be very brilliant, and advanced-themed.